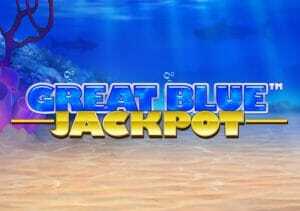 Finding treasure in the depths of the ocean is the goal in Great Blue Jackpot. Created by Playtech, it’s a 5 reel, 25 payline video slot that comes with some potentially exciting extras. Look out for the wilds that double standard symbol payouts as well as offering payline awards of up to 10,000 coins in their own right. There’s also a bonus round where up to 33 free spins with multipliers of up to 15x can be won initially. Finally, there are 4 jackpots to be won. Stakes range from between 25p and £12.50 per spin. The action here takes place against an ocean floor backdrop complete with assorted aquatic vegetation. The reels are made up of lower value A to 9 symbols as well as starfish, seahorses and exotic fish. Most rewarding of the standard symbols are the turtle and shark which offer payouts of up to 750 coins per line. Those number are dwarfed by what’s on offer from the great blue whale which is the wild. If 2, 3, 4 or 5 of these swim into view on the same line you’ll pocket 10, 250, 2,500 or even 10,000 coins. The wild also doubles the payout if it combines with a standard symbol to make a winning combo. The main feature offering is the Pearl Bonus feature which is triggered by landing 3, 4 or 5 scatters. After a payout of 5, 20 or 500 times your total bet is made, you’ll head to a new screen and choose from a selection of pearl shells which will add more free spins and multipliers to your initial allocation of 8 free spins at 2x. You could end up with 33 free spins and/or multipliers of 15x here. Landing 3 scatters on the same free spin delivers a retrigger and another round of free spins. There’s no limit to how many times you can retrigger the feature either! As you can tell from the name, Great Blue Jackpot can also deliver life-changing payouts. The progressive jackpot round can hit at random. Once it does, you’ll be offered a selection of coins. Find 3 of matching colours and you’ll win 1 of the 4 associated jackpots – Fish, Turtle, Shark and Whale. There’s nothing overly flashy on offer in Great Blue Jackpot as far as design goes. The visuals are neat and tidy though and the backing track could come from a holiday TV show. It’s an improvement on the non-jackpot version though (Great Blue). What makes the game stand out are the features. The wild multipliers and the free spins with even more multipliers offer some serious potential. Throw in the progressive jackpot and there’s plenty to like here. Like the original, it’s highly, highly volatile! If you fancy your chances in these choppy waters then by all means dive in and take a dip.